Obama (Officially) Wins! Electoral College Votes Tallied Before Congress : It's All Politics On Friday, it was confirmed that President Obama won the election with 332 electoral votes tallied in his column. Of course this is old news. But the formal count mandated by the Constitution took place before a joint session of Congress, heavy on ceremony and light on attendance. 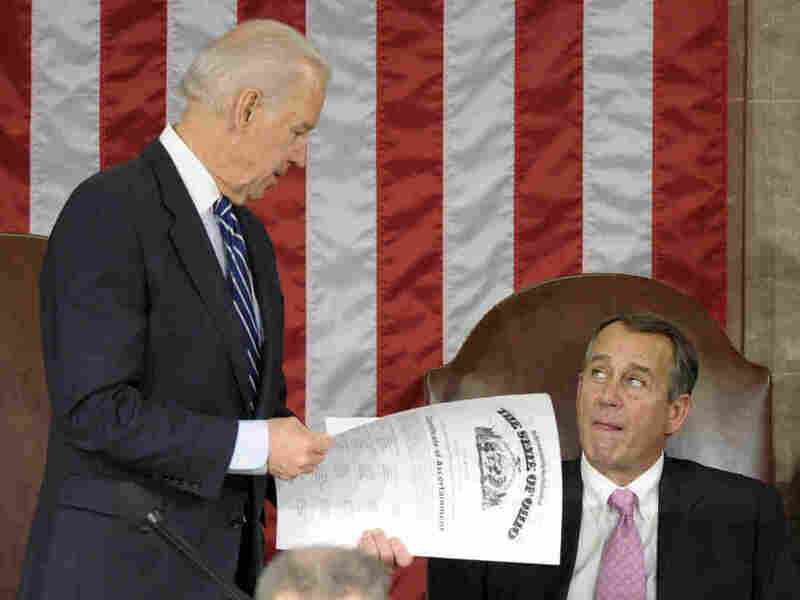 Vice President Joe Biden shows the certificate of the Electoral College vote for Ohio to House Speaker John Boehner during a joint session of Congress on Friday. President Obama has officially won the election, with 332 electoral votes tallied in his column. Of course this is old news. 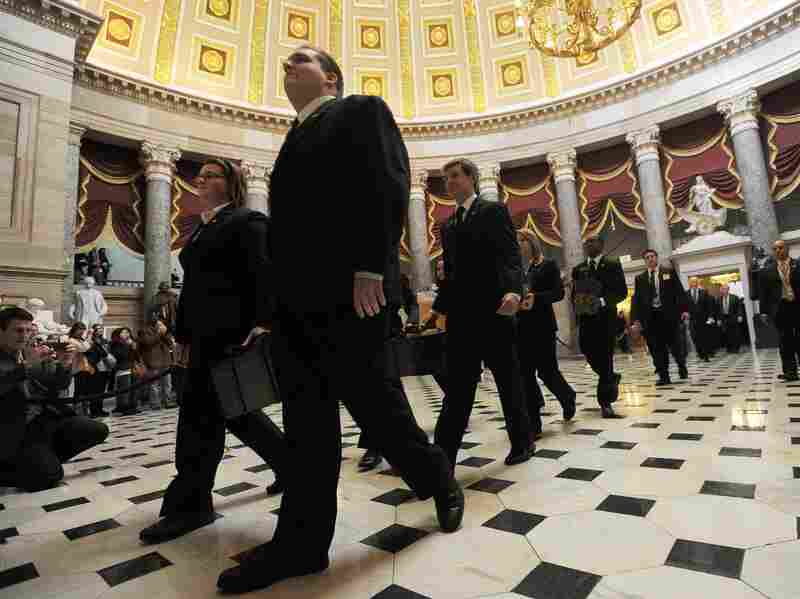 But the formal count mandated by the Constitution took place Friday in a joint session of Congress, heavy on ceremony and light on attendance. Young Senate pages led the way into the chamber carrying two mahogany boxes holding the "certificates of vote" mailed in from around the country. Others carried three bronze baskets holding narrow blue boxes. It turns out these were the ceremonial letter openers — one for each state. The pages were followed in by Vice President Joe Biden and a group of senators. Even with senators padding the numbers, the chamber was largely empty — only slightly more populated than your typical afternoon of made-for-C-SPAN speechifying. Senate pages carry the "certificate of vote" at the Capitol on Friday. The room was quiet, the scene totally low key as the Senate parliamentarian opened each envelope. There were big envelopes and smaller ones, priority mail envelopes and manila envelopes, each one opened using one of the commemorative letter openers, whether it was really needed or not. Then the Senate parliamentarian handed the certificate of votes to the secretary of the Senate, who handed it to the House parliamentarian who handed it to Biden, who then handed it to one of the senators serving as teller. With each state and the District of Columbia, the senator/teller came to the mic and repeated a nearly identical script. "The certificate from the electoral vote of the state of California seems to be regular in form and authentic," read New York Democrat Chuck Schumer. "And it appears there from that Barack Obama of the state of Illinois received 55 votes for president." A couple of House members from California cheered, breaking the quiet. When Minnesota's tally was read, a lone congressman clapped. And so it went, state after state. When the final tally was announced, there were no surprises. President Obama won with 332 votes to Mitt Romney's 206. At the moment it became official, California Democrat Karen Bass snapped a photo on her cellphone.